1899 :: Just because it is carved in stone does NOT make it true! She was lying across the axle dead, with her hair and clothing wound around the spindle of the buggy. . . . It was the autumn of 1999, and I was on the phone with my Mom, listening to her read these words from her handwritten notes . 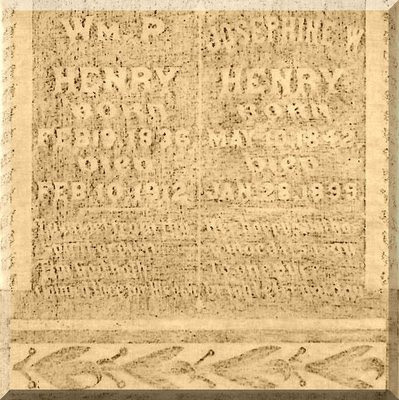 . .
As you can see in the tombstone rubbing shown here, it is "carved in stone" on this grave marker that Josephine W. Henry died on the 28th day of the month of January in the year 1899 . . . this Josephine is a 2nd great-grandma to the Keeper of this family history blog . . . and this date of death is the one that has been recorded in every family history record I have seen for generations in our family . . . I grew up hearing stories of how "our Josephine" died by being dragged to death by the hair of her head . . . I always figured if there was even a kernel of truth in that story, then there should at least be a mention of it in the local newspaper . . . the little town in Central Texas where I grew up . . . and near where Josephine and her family lived in the last quarter of the 19th century . . . actually has copies of the area's 1899 newspapers available on microfilm at the local library . . . but no matter how many times I looked at that microfilm, I could find no mention whatsoever of Josephine's death in January or February of 1899. . . . Shortly before her 1899 death, Josephine and William and all of their living descendants posed for a family photo . . . based on the babies appearing in this photo (born in March and September of 1898) . . . as well as the babies who are not present in the photo (born in May and July of 1899 . . . it is currently assumed that the image of this family gathering was captured sometime during the winter of 1898-1899 . . . March of 1899 would have marked their 35th wedding anniversary . . . mayhaps the gathering was to mark that occasion? . . .
Sooo . . . one hundred years later . . . 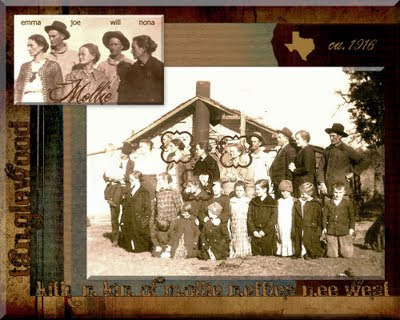 It was decided that the centennial anniversary of the family gathering documented in that late 19th century family photo was the perfect time for a gathering of descendants of Josephine and Wm. P. Henry . . . there had been a few reunions during the preceding century, but none in quite a while . . . a mailing list was put together . . . invitations went out . . . multiple displays were assembled to showcase the family history of the descendants of Josephine and Wm. P. Henry . . . and on a stormy Saturday in the fall of the year 1998, approximately seventy-five of our kith 'n kin gathered at the Minerva Community Center in Milam County, Texas (very near where the ca. 1899 photo was taken) . . . the reunion was a surprising success, so another year later, as I was preparing for the final such gathering of the 20th century . . . In September of 1999 I received an email from a Henry cousin (Peggy) who had found a yellowed and crumbling newspaper clipping in some papers she inherited . . . about a 1931 Henry Reunion . . . and in that clipping was the following eye-opening statement . . . October!?! Not January?!? . . . as carved in stone on her gravemarker . . . sooo . . . I called my Mom in our hometown . . . and prevailed upon her to make a trip to the local library for me . . . and lo and behold . . . right there in the grainy black and white of that microfilm were multiple newspaper accounts of the tragic death of our Josephine . . . once I knew the correct time period, I even found a mention of the tragedy in an 1899 edition of The Dallas Morning News . . . the multiple newspaper accounts of our Josephine's death all support the fact that she actually died on 28 October 1899, i.e., 10-28-1899 instead of 01-28-1899 . . .
Rockdale, Milam Co., Tex., 29 Oct – A very sad accident occurred about three miles north of Rockdale late yesterday [Saturday] afternoon in which Mrs. W.P. Henry, a lady about 60 years old lost her life. 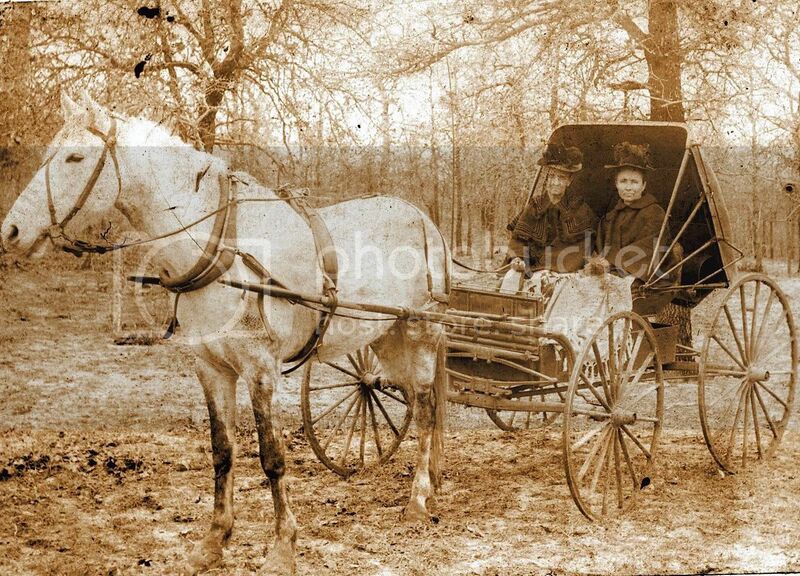 While driving home from her son’s her horse became frightened, ran away and smashed the buggy into kindling wood and when found Mrs. Henry was dead. It is supposed she was killed instantly. She leaves a husband, a large family of children and many friends to mourn her untimely death. Last Saturday news reached Rockdale that Mrs. W.P. Henry had been killed by her horse running away with her. When she was found between her home and that of George Banzoff, near the gate that leads to Dr. Isaac’s home, she was lying across the axle dead, with her hair and clothing wound around the spindle of the buggy. One of the wheels was broken, and the rim of this broken wheel was found near the Murray school house, from which place she was dragged to where she was found. The road indicated that the horse had been frightened and ran away. The wheel showed that the rim of the wheel had received a wrench and broke it loose from the spokes. Her funeral took place Sunday at Murray school house, and a large procession of friends and relatives witnessed the ceremonies that consigned her body to its last repose. She was the wife of W.P. Henry, one of our most substantial and upright farmers and the mother of five children, all grown [plus three who died young]. The Reporter extends sympathy to the bereaved family. Since the account of the tragic death of Mrs. W.P. Henry, on another page of this paper, was printed, we learned the following details in regard to her death. As she was nearing the house of Geo. Banzhoff, her buggy ran into a wagon in which were two young men*, Messrs. Bradley and Jenkins. This collision broke the rim off the wheel referred to in the other account, and evidently she was thrown out of the buggy at that time, as when found her head was caught between the wheel and the shaft, on the side opposite the broken wheel. The road over which she went showed where her limbs had been dragged from the point where the collision occurred to the place where she was found. The men state that she was in the buggy as far as they could see, but in this they were mistaken. The buggy top was raised and it was impossible for them to see a person in the vehicle, and as they saw no one on the ground, they naturally supposed that she had not fallen out. It is indeed unfortunate that these men did not follow her and rescue the body, when they found out the wheel had been broken. While they doubtless thought she was unhurt, they should have gone to her and rendered what assistance seemed necessary. Her neck was doubtless broken by the fall, and while they could not have saved her, they could have carried the body home when the accident happened. Accident - Mrs. W. P. Henry who has lived on the Cameron road, 3-miles from Rockdale for over 20-years left her son’s home on the Dr. A. C. Isaacs farm, about 3-miles beyond her home, to come home and as was her habit, she pushed her buggy animal, a gray mare that she has driven for several years, into a lope. the 28th day of October . . . in the year 1899 . . .
is dragged to her death . . .
by the hair of her head . . .
does NOT mean it's true! On this date in our family history . . . the 24th day of October . . . in the year 1852 . . . a baby girl is born in Oktibbeha County, Mississippi . . . the proud parents are Richard C. West (ca. 1816 - bef. 1865) and Sarah Mildred Carter (ca. 1830 - ca. 1868) . . . they name their 1st-born child Mary Annie West, but she is almost always referred to as Mollie . . . her sweet face can be seen framed in the center of the group photo, and Mollie can also be found at the center of the photo in the upper left corner where she is pictured with four of her adult children. Mollie marries and becomes the mother of nine children, including a daughter by the name of Emma Patience Nettles (1882-1964). Emma's face is framed in the group photo -- she is on the left. Emma has a daughter given the name Ima Lois Muston (1906-1999). Ima is the little girl with the big white bow in her hair -- her face is also framed. 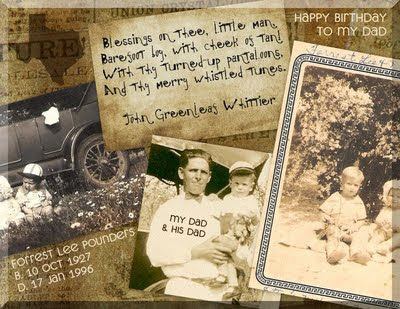 Ima has two sons, including the father of the Keeper of this geneablog -- Forrest Lee Pounders (1927-1996). Regarding Mollie's childhood, Miss Ruby wrote that . . . Her birthplace was a one-room log house with one window and one door, and a stick and mud chimney. We were quite poor, I guess, said Grandma, but I never remember being hungry. Here they lived until the Civil War broke out in 1861. Because the men folk were soon away from their homes fighting or training, the women and children often gathered in the homes of relatives who had houses large enough to accommodate them. Sarah Mildred's sister, Mary, who had married Wm. VALENTINE, lived in a home of six rooms, a long wide hall, two large porches and a portico in front of Mary's room. 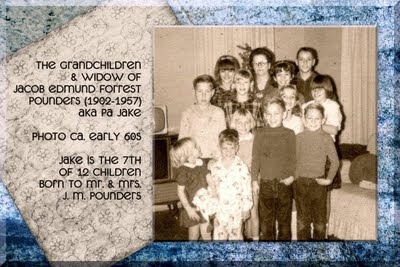 The VALENTINE children were Dave, John, Lou and Margaret, and their WEST cousins were Mary Ann (Mollie), Billy and Dave. So for the four long years of war the VALENTINE residence was often home to the WESTS. The above quote is from a narrative about Mollie's Memories which was compiled by one of Mollie's granddaughters -- Ruby Lee Vance nee Nettles (1910-2003) . . . Miss Ruby is a daughter of the Joe named in the photo in the upper left corner, and is a 1st cousin to my paternal grandma, Ima (mentioned above) . . . the group photo used in the collage has the following names handwritten on the back of it . . . from the left . . .
Back row: Jim Hooper holding Pauline Muston, Mrs. Jim (Polly) Hooper, Joe Nettles, Mrs. Emma Muston, Mrs. Frank (Nona) Moore, Guy Burroughs, Mrs. M. A. (Mollie) Nettles, Will Nettles, Cy Cook, Mrs. Cy (Blanche) Cook, and Tom Bryant. 2nd row: Erma Muston, Ilona Thomas, Ima Muston, Elva Moore, Gertrude Muston, Maud Moore, Stella Muston, Inez Bryant, Bernice Moore. 3rd row: Corinne Moore, Nona Muston and Gladys Muston. The following notes were jotted down while attempting to acquire information from Ima about the folks in the group photo . . .
For further reading about our Mollie . . .
1) Pick one of your four great-grandparents - if possible, the one with the most descendants. 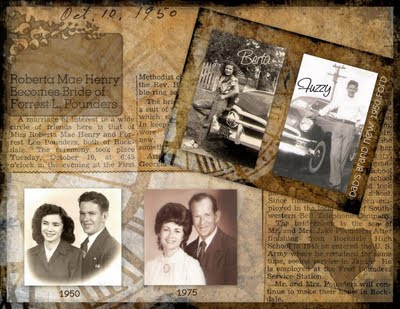 2) Create a descendants list for those great-grandparents either by hand or in your software program. 3) Tell us how many descendants, living or dead, are in each generation from those great-grandparents. 4) How many are still living? Of those, how many have you met and exchanged family information with? Are there any that you should make contact with ASAP? Please don't use last names of living people for this - respect their privacy. 5) Write about it in your own blog post, in comments to this post, or in comments or a Note on Facebook. My most prolific great-grandparents (by far) are my father's paternal grandparents, James Madison Pounders (1867-1942) and his wife, Mary Susan [Cain?] (1873-1950). Their 12 children (all now deceased) were given some of the more unique names in my family tree. 35 Grandchildren with 15 known or thought to be living. That equals 248 known descendants -- and I know there are more, but I do not have that info at this time -- need to work on gathering and collecting those names and dates! James Madison Pounders died in Rockdale, Milam County, Texas in 1942, and that is where I grew up. A large percentage of his descendants are still there and / or return there often to visit family, so I grew up knowing many of these people. 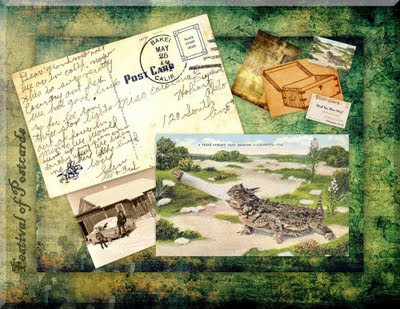 Some did move to other states or other parts of Texas, so there are a few I never met, but even some of those have been in touch via mail and/or email. I descend from the 7th of the 12 children born to Jim and Mary Susan -- that son was my "Pa Jake." This photo shows all of the grandchildren of Pa Jake. I am his 1st born grandchild, and am standing on the left on the back row in this photo. On this date in our family history . . . the 17th day of October . 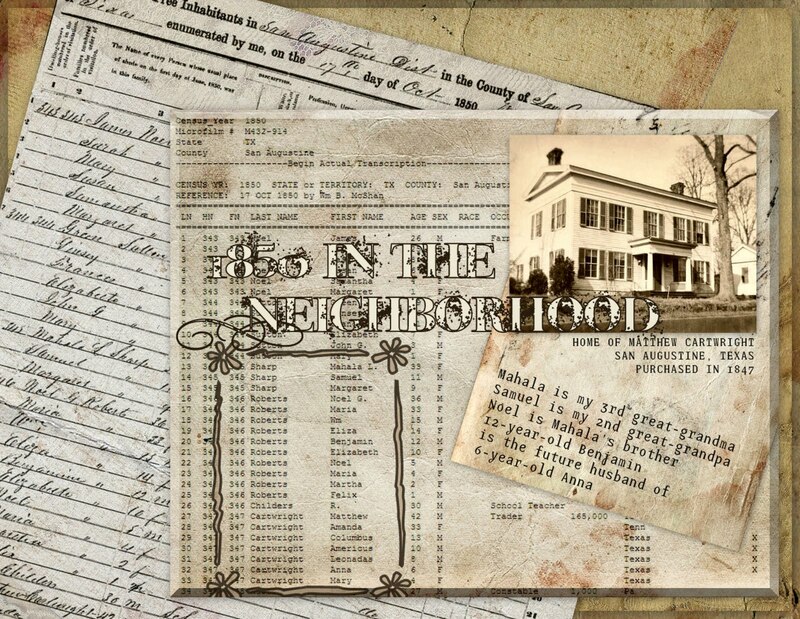 . . in the year 1850 . . . 33-year-old Mahala L. Sharp is enumerated in San Augustine, Texas . . . this Mahala is my 3rd great-grandma . . . also in her household are 11-year-old Samuel Sharp (my 2nd great-grandpa) and 9-year-old Margaret Sharp (future wife of James Madison Hall, the Keeper of The Journal) . . . other folks in the neighborhood (on the same page) include . . .
Noel G. Roberts (Mahala's brother) and his family . . . including 12-year-old Benjamin Roberts who in 1869 marries Anna Cartwright, who in 1850 is the 6-year-old Anna Cartwright who is listed in the household of . . .
Matthew Cartwright . . . the house pictured in the heritage collage above was the home of said Matthew Cartwright in 1850 . . . and was apparently next door to the home of our Mahala . . . Missing from the 1850 census is Mahala's first husband, John M. Sharp (my 3rd great-grandpa) . 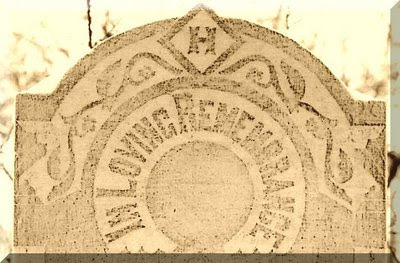 . . the marriage records for San Augustine indicate that John and Mahala were married in 1838 . . . and he appears on the tax list for that year . . . the daughter mentioned above (Margaret) is born in 1840 . . . by 1846, the tax lists are showing Mahala Sharp, with no mention of John . . . and we have no further evidence of our John's existence . . .
On this date in our family history . . . the 10th day of October . . . in the year 1950 . . . shortly after the sun rises . . . 18-year-old Roberta Mae walks out of the home she shares with her paternal grandparents in central Texas . . . and climbs into a waiting car . . . it is an autumn's Tuesday, and . . . it is the birthday of the driver of the car . . . Roberta's grandma, Berta Mary, is aware of the plans for the day . . . and wishes them a safe journey as they leave town . . . the driver heads south from Rockdale . . . towards Freeport, Texas . . . that is where Roberta's only brother, Robert, lives and works, as does her cousin, Georgia Faye . . . the first stop in Freeport is Georgia's apartment . . . where Roberta changes into the navy-blue suit she had recently purchased at Goodfriend's on Congress Avenue in Austin . . . there is a bouquet of zinnias sitting on the piano when they walk into the little Methodist church in the neighborhood. . . and there, with Robert and Georgia as witnesses, a small wedding takes place . . . when Roberta next returns to visit the wood-frame house where she spent most of her growing-up years, she is the new bride of 23-year-old Forrest Lee Pounders (1927-1996) . . . Happy Anniversary, Mom & Dad . . .
On this date in our family history . . . the 10th day of October . 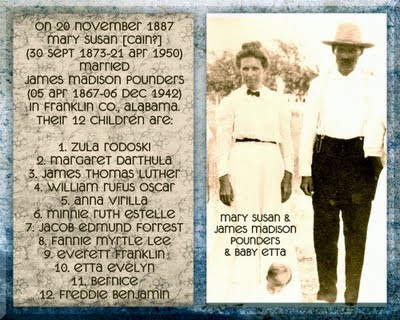 . . in the year 1927 . . . a baby boy is born to Jacob Edmund Forrest Pounders (1902-1957), and his wife of one year, Ima Lois Pounders nee Muston (1906-1999) . . . that baby boy is named Forrest Lee Pounders (1927-1996) . . . and he grows up to become my Daddy . . . Happy Birthday, Dad! On this date in our family history . . . the 7th day of October . . . in the year 1936 . . . Eva Mae Smith dies in Lynn, Essex County, Massachusetts . . . my Mom (born in 1932) knew this Eva as her Grammie Smith for four short years . 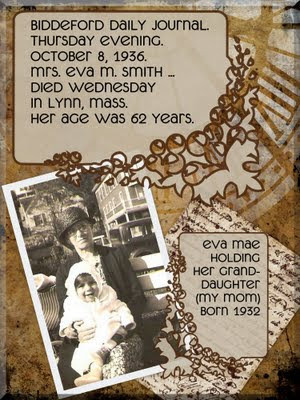 . . Eva was my maternal great-grandma . . .
Biddeford Daily Journal, Thursday Evening, October 8, 1936. Mrs. Eva Smith Died in Lynn. Mrs. Eva M. Smith, widow of Thomas W. Smith, a former resident of this city, died Wednesday in Lynn, Mass. Her age was 62 years. Funeral services will be held at 2 o'clock Saturday afternoon at the Dennett & Craig funeral home, 365 Main street, Saco [Maine]. Burial followed in the family plot at the Laurel Hill Cemetery . . . The Keeper of this geneablog is most humbled to be seated amongst the great cloud of geneabloggers you see listed in the collage* to your left. BeNotForgot is listed in the upper left of the 2nd image. Congratulations to each and every one of y'all who are listed here -- you are most deserving of the honor. And I just love all the creative names y'all came up with for your blogs! 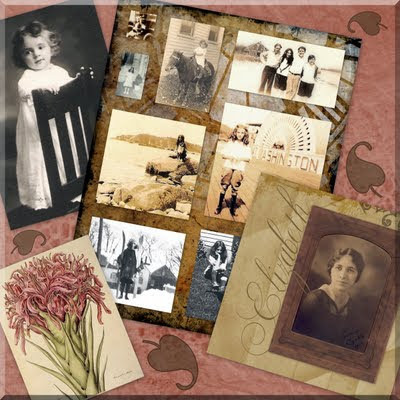 For those of you who are not aware of this recognition of those who blog about genealogy, click > HERE < to read the announcement from Family Tree Magazine. 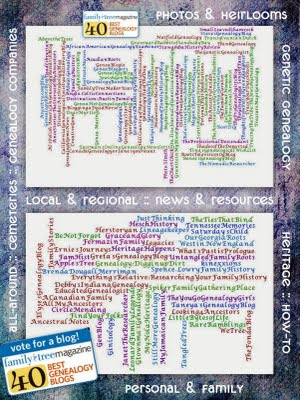 Click > HERE < to find an alphabetical listing of each of the blogs named in the word clouds, organized by category with clickable links (thanks fM!). If you have the time, visit them all! Click > HERE < to go to the Voting Ballot. 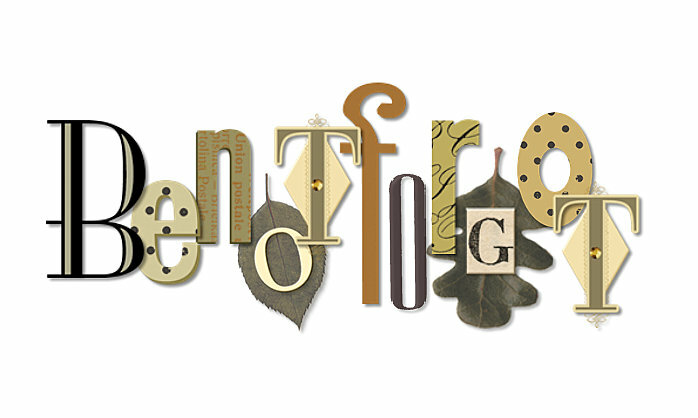 You are allowed to vote multiple times in each category, and if you wish to vote for BeNotForgot, you will find this blog listed with the Personal & Family Blogs, which is category #10. * Click on the collage to enlarge it . . . and you're more than welcome to take a copy for your own use. These "word clouds" were created at > wordle.net < and then edited in Picasa to create this image. Remembering my maternal grandma . . .
and the Mother my Mom never knew . . .
"I'd like to add some beauty to life,"
if I hadn't been born." Elizabeth, I sure am glad you were born . . . because of your birth . . . and the gift of life you gave my Mom . . . I've been blessed with the very best Mother I could have ever dreamed of . . . with love & gratitude . 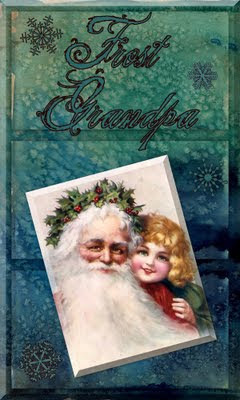 . . from your granddaughter . . .
On this date in our family history . . . the 3rd day of October . 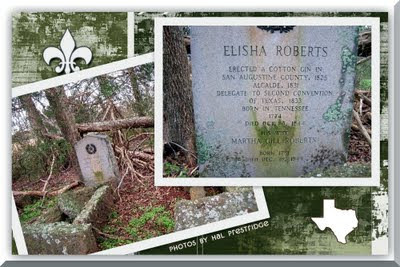 . . in the year 1844 . . . Elisha Roberts dies in San Augustine County, Texas . . . and is laid to rest in a small family cemetery near his home . . . this Elisha is the father of our Mahala . 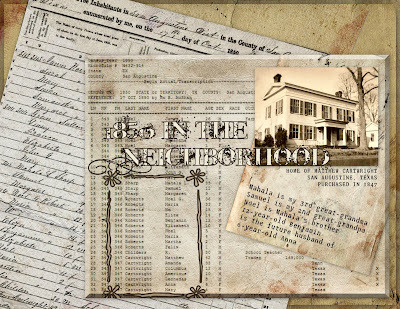 . . and a 4th great-grandpa to the Keeper of this family history blog. 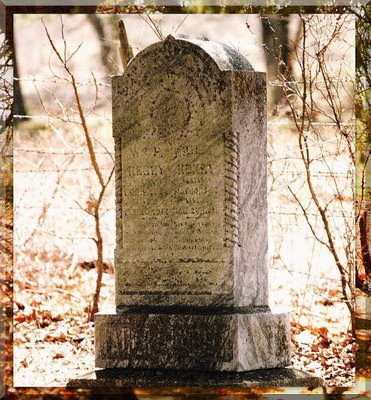 In celebration of the Texas Centennial in 1936, granite Centennial markers were placed at historical sites around the state, including the grave and the homesite of our Elisha. According to The Handbook of Texas Online . . .
ROBERTS, ELISHA (1774-1844). Elisha Roberts, pioneer and public official, was born in 1774 at Watauga Settlement, near the Holston River in Hawkins County, Tennessee, the son of George and Rhoda (Payne, Paine) Roberts. He was married by 1800 in Kentucky to Martha Gill; they had nine children, including Esther Jane, who married Philip A. Sublett. The family moved in 1811 from Green County, Kentucky, to the northern part of St. Tammany Parish, Louisiana (later Washington Parish). During the War of 1812 Roberts served as lieutenant and quartermaster under Gen. Isaac Roberts' Brigade of West Tennessee Militia and lieutenant in Captain Bickham's company, Louisiana militia. In 1822 Roberts entered East Texas in pursuit of a runaway slave whose wife had been carried to Texas by another master. Roberts was attracted by the redland countryside east of Ayish Bayou. He returned to the site in 1823, when his slave ran away again, and found the land occupied by a Spaniard, to whom he traded a slave for the land and improvements. In January 1824 he settled his family near the site of present San Augustine. Shortly after, his brothers [sic], Redden and William Roberts, moved into the area. In 1825 Roberts's thirty slaves dug out the branch springs on Tiger Creek, a tributary of Palo Gaucho Bayou that became known as the Old Brick Spring, and built a cotton gin, at that time one of four in the district; the others belonged to John Cartwright, John Sprowl, and John A. Williams. Roberts was elected alcalde of the Ayish Bayou district in 1831. He held court on the broad front gallery of his house; Sam Houston, James Bowie, David Crockett, William B. Travis, and Stephen F. Austin all boarded there. In 1833 Roberts was elected delegate to the convention in San Felipe. He was one on a committee of fifteen to select the townsite of San Augustine, which was built in 1834. He received a Mexican land grant on November 7, 1835. In 1835-36 he furnished provisions, lodging, and transportation for the revolutionary cause. In 1837 he became a member of the board of trustees of San Augustine University. 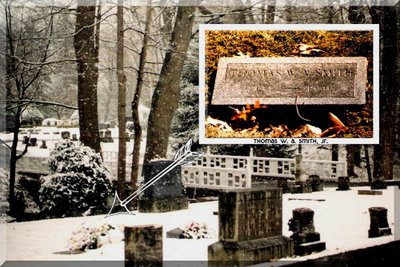 On October 3, 1844, Roberts died, and on December 18, 1845, his wife died; both were buried near their home. In 1936 a Texas Centennial marker was erected at the site. Handbook of Texas Online, s.v. "ROBERTS, ELISHA," http://www.tshaonline.org/handbook/online/articles/fro12 (accessed April 19, 2006).